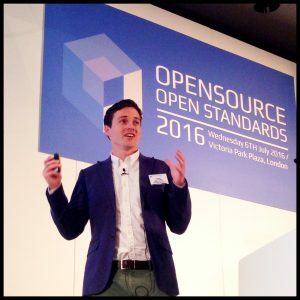 Last Wednesday I spoke at the Open source 16 conference. With some other great talks from Government Digital Service, Greater London Authority and NHS England, it seems HMRC is not the only government organisation experiencing some incredible benefits through the use of open source software. At HMRC we've definitely changed our attitude to the use of open source technology over the last four years and this couldn’t be truer than within the Digital space. While Government Digital Service has helpfully been a huge advocate of open source products in Government this has in turn helped HMRC Digital move to our current use of open source at every level. My talk focused on how at HMRC Digital we came to find ourselves running open sourced services which we write and publish on www.github.com/hmrc, on open source infastructure components such as NGINX, Docker, MongoDB (and many more), which in turn run across an Openstack Cloud IaaS provision. One point I made at Open Source 16 was that we didn’t originally start four years ago with a mandate to only use open source software. We have arrived at this position quite naturally. And not to mention the price! Finally at an infrastructure level using an Openstack provider was a natural progression for us to expand into. It allowed us to span the Tax Platform across IaaS suppliers adding resilience, decrease the risk of technological tie-in by using two separate IaaS technologies and, gave us an easy to use cloud with a standardised set of Openstack APIs. To finish I will just say that Open Source 16 was a fantastic conference with some great insights into how organisations are getting the best out of open source and open standardised. I’m already looking forward to next year!